Skin Wefts hair Extension Evolution Russian Absolute Premium quality hair. Reusable Skin Weft Extensions lasting for years. These extensions can be colored (darker than color provided) or permed and will remain soft, silky and with great movement for years. Using premium hair for Skin Weft Extensions allows them to blend easier, appear more natural and gives you the added advantage of such beautiful high quality hair framing your face which enhances your overall look. It is this element that give you the more polished, more elegant, red carpet, model level look and the hair will also maintain its style and look for longer throughout wear and throughout its long lifespan. Individually threaded hair into a silicon base, this base is left its full 100cm length so you may cut as desired. This long piece does not have tape attached so you can use it for a variety of different attachment methods, but equally easily can have tape applied. Within these weft the hair follicles are sandwiches between the silicone and then the silicone is cut into 2.5 inch pieces. 40 pieces within each pack – weighing over 3 oz this provides plenty of hair for volume, length, color or style. Pretaped simply remove the adhesive backing and apply. If you have not tried Skin Wefts before we would suggest Cut Skin Wefts for ease of use, if you are using a new method of attachment such as the metal tubes attached by threading hair through – we recommend the Hand Skin Weft. 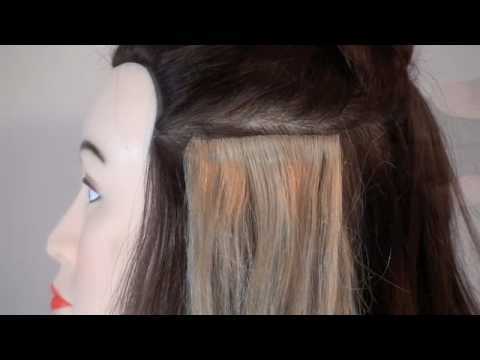 As the wefts are full and the hair healthy, you may not need to use all pieces to create your look. The first ingredient we start with to make our extensions is No 1 Premium hair quality, raw, virgin, pure, and absolutely untreated, we then use the best methods to create the extensions you desire. We use the best possible hair for extensions so you receive Tangle free, soft, silky, full movement, vibrant never dry, cuticle perfect hair. Treated right it will last indefinitely.